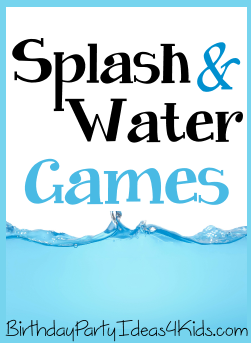 The best Splash and Water games for parties! Great for kids, tweens and teens. When the weather gets hot send everyone outside for these fun games to cool off! All the games are easy to set up, inexpensive and fun for everyone! Teams try to move the beach ball using only their water guns into the opposing teams goal. A great game that is fun and challenging. Play individually or in teams. At least 1 day before the game wet down large t-shirt with water and fold. Place wet t shirts into the Ziploc bags and fill with water. Close the bags and place in freezer. Before the party fill the plastic shoeboxes with ice. Place 8 - 12 small plastic prizes like dinosaurs, figures, animals, etc. in the box and stir so the items are evenly distributed throughout the ice. Pour water on top of the ice and freeze at least overnight. During the party give each guest a frozen block and a rock. The first one to get all of their figures loose from the ice block wins. Fill a kiddie pool with water and ice cubes. Players have to use only their toes to move as many ice cubes from the pool to their cups. Set a time limit of 5 - 10 minutes or the first one to fill their cup wins! Take Kickball to the next level with this fun splash game! Played just like regular Kickball, but at every base place a blowup kiddie pool filled with water. Players have to be inside the pool to be safe on the base. Play to 15 goals. Leaky Cup Relay is played just like the Sponge Relay above except players use plastic cups to move the water from the large tub to their container. Very wet and challenging for all ages! Place a large plastic tub filled with water at one end of the playing field. Divide players into two teams and have them line up one after the other facing the direction of the large tub. At the end of each line of players place a tall plastic container. The object of the game is to be the first team to fill their tall plastic container to the top with water. On "go" the first player runs to the tub of water and fills their cup with water. Then they run back to their line and faces away from the players in their line. They take the cup of water with both hands and raise it over their head and tip the cup. The player behind them tries to catch as much water as they can from the first player and then dumps the water in their cup over their head to the player behind them and so on. The last player in line puts the water in the tall container. Play continues until the tall container has been filled to the top. Fun and challenging because the player dumping the water over their head can't see where it's going. Great to play on a hot day because everyone gets wet! For older children, tweens and teens (9, 10, 11, 12, 13, 14, 15, 16, 17, 18 years old) make it more challenging by making the last person in line run to the front of the line after they dump their water in the container. Each person moves back in line and gets a turn to be the front and the back! Set up the game by punching 1 hole in each cups bottom about 1/2 inch from the side. Tie the string onto a tree and then thread the end of the string through the hole in the bottom of the cup. Tie the other end of the string a distance away about 4 - 5 feet from the ground. Make a separate string and cup so that teams can play or more tracks for individual games. The object of this fun game is to move water from the large water container to a milk jug using only the middle channel of the pool noodles. Players must fill up the center of a pool noodle with water and then work together to place their noodles end to end to move water across the playing field into their teams container. The first team to fill their jug to the top wins! Squirt guns, shaving cream and 2 large beach balls. Cover the beach balls with shaving cream. Set the beach balls on top of a large plastic cup so they don't move. Divide the kids into two teams and give each player a water gun. Teams try to clean off the shaving cream from their beach ball using the water from their squirt guns. The first team with a clean beach ball wins! Kids love Slip and Slides for the summer! Make them more fun by placing two side by side. Let them slide down with blowup rings, air mats and beach balls for more fun! Divide kids into two teams and each team is given an equal number of water balloons. Players line up side by side and sit on the ground. At one end of the teams is a container filled with water balloons and at the other end is an empty container. Players must pass the balloons down the line to each other using only their feet. The last person in line places the water balloons in the empty container. Set a time limit or the team with the most balloons after all the balloons have been used wins! Played just like regular tag only players tag each other with a wet sponge ball. When a player has been tagged they pick up the ball and try to tag another player. Large tub of water, 2 large sponges, 2 identical plastic containers with small opening at the top. Teams race to be the first to fill their container with water. Teams line up and the first person in line takes the sponge and dips it in the large tub of water. They then run across the playing field to their container and squeeze the water into it. They then run back to their team and hand off the sponge to the next person in line. Play continues until a teams container is full and overflowing. A really silly game and lots of fun for kids, tweens and teens! The object of the game is to get as many water balloons across the field in the shortest amount of time only by carrying them in the sweat pants. Teams decide who will wear the sweat pants and that person puts them on. Players place as many water balloons inside the sweat pants as they think the player can carry across the field without popping them. The player then runs across the field - carefully! - and takes the balloons from the pants and places them in a container. They then run back to their team where another player puts of the pants and fills them up. Play continues until time runs out. This fun water game is played just like Dodgeball only water balloons are used instead of a ball. On the playing field draw a line down the middle (spraypaint that can be used in grass, or with painters tape for hard surfaces) and have 2 team stand on either side of the field. In the center of the field have a large tub full of water balloons. On "go" teams race to the center of the field and try to grab a water balloon from the tub. Teams will have to be strategic on who they send to the tub first because not everyone can grab a balloon and keep from being hit from the other side with a water balloon. Teams throw their balloons at each other. If a player is hit they have to sit out until one of their team members catches (without popping) a balloon from the other team. Play continues until one team has eliminated the other teams players. Tip: Have extra water balloons ready to refill the center tub. Players break in to teams of 2. Each team gets a water balloon. Teams face each other about 10 feet apart and toss the water balloon to their team player. If their teammate catches the water balloon then each player takes a step backward and they throw the balloon back. If they balloon breaks then the team is out. Play continues until there is one team left with an unbroken balloon. Set the plastic cups upside down to form a pyramid (3 cups on the bottom, 2 on the next level and 1 on the top). Players take turns trying to knock down the pyramid with water from their squirt guns. Use the stream of water from a garden hose to play Limbo. Start by lining players up and holding a stream of water about 5 feet from the ground. Let all players go under the water bending backwards. If they break the stream of water they are out. On the next round lower the water level by 6". The winner is the last one who can complete the lowest level of water! Break kids into teams and give each player a plastic cup. Make them stand in a line with at least 5 feet between each player. The first player fills their cup from the large tub of water and then tosses the water to the next player in line who tries to catch as much of the water as they can with their cup. Players continue tossing the water down the line until the last person pours what's left into their milk jug. The winning team is the one who fills their milk jug to overflowing first! Very challenging and fast paced! Pool Noodle Games - no pool required!